Tim Brannan has statted Morgan Ironwolf for the latest rules. 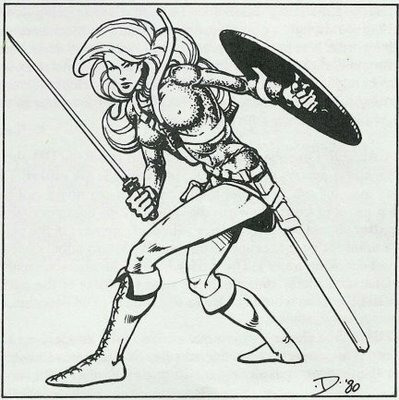 Morgan is the original Dungeons & Dragons crush, predating the better-known Aleena by a couple of years. For some reason, nobody blogs about sexing up Black Dougal. That these characters-who-are-barely-characters have stuck with us so fiercely makes me happy. It speaks to the arbitrariness of affection, or perhaps the willingness to conjure pretty traits from bare hints. Next → Next post: Power. Danger. Mystery. Romance. I think it was because we were given so little. I don’t care about Drizzt or Elminster. Too much has been said about them and even if I wanted too, I have NO idea where to start. Morgan and Aleena (beside the addition benefit of being easy on the eyes) resonated because we read about them, but never enough to know what their story was. Morgan was Lawful (and Lawful Good in my newer version), what lead her to pick up a sword? Did orcs murder her family? Was she the only girl in a family of boys and they all got the same training? Sometimes it isn’t what we know, but what we don’t know yet.